Mini LED Projector is light Weight and simple operation. The projector is small and light, easy to carry. The LED lamp can works for over 20,000 hours, and will provide a superb picture. The LED lamp can work for over 20 thousand hours, and can provide beautiful colors, no radiation, more eye protection. 1x ABOX Projector. Lamp: LED, Lamp Life: 50000 hours. 1x 3 in 1 AV cable. Features: The professional appearance design for ventilation has largely improved the stability and life time for the projector The LED lamp works for over 20,000 hours and provide superb pictures. Professional troubleshooting and protection measures The projector is small and light and easy to carry Free change from16:9 and 4:3. Secifications: Model: VS320 Native Resolution: 320 x 240 Lamp Model: LED Language: Chinese/English/ect Image Size: 20-80 inch Color: 1677k Power waste: 24W Contrast: 300:1 Weight: 500g Operation Mode: Manual Romote Control Output: Head phone Imaging System: LCD. Nail Care & Polish. Club Cocktail Dress. Wedding Dress. Flower Girl Dress. Prom Evening Dress. Celebrity Dress. Eye Makeup. Lens: F125. 1 x 1080P Projector. Patent dial-type focusing lens. Abandoned the original rough way of fwisting the lens to be focused. 1 x AV Cable. Input Resolution 1080p. Life hours:20000 hours. Size: 123mm 86mm 56mm. We appreciate your prompt re ply and look forward to deal with you again. Descriptio n.
Equipped with HD, USB, AV, Headphone jack and TF card slot, easy to connect with Laptop, PC, USB disk, TF Card, etc. You can watch your favorite videos or movies with bigger screen via HD/USB/TF Card. It will bring you munch convenient and unexpected experience. 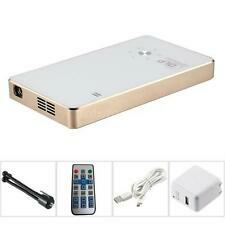 - 2 in 1 Multifunction: Android 4.4.2 DLP LED Projector Smart TV Box (Freely Switch). - Support Wi-Fi (2.4G / 5G Dual Band WiFi). - Support dual frequency 2.4Ghz / 5Ghz WiFi up to 1000M/s, movie never pause, no need waiting anymore. 7000 Lumens Full HD 1080P LED 3D LCD VGA HDMI TV Home Theater Projector Cinema m Features: Provides you fantastic fun of home theater projector in the daytime or darkness, projection is clear and distinct. 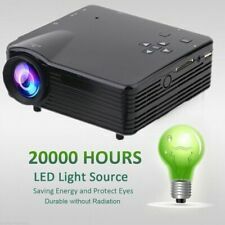 This is an good Mini led Projector for home cinema Movies, child games or cartoon movies or Business presentations and meetings, the projection image size can be up to 130 Inches with 1000 ANSI Lumens and 1000:1 contrast ratio as well as HDMI, AV and USB ports. 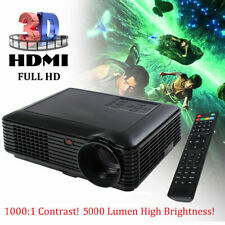 5000 Lumens HD 1080P Home Theater Projector 3D LED Portable SD HDMI VGA USB MG! Support input Resolution 1080p. Input Resolution 1080p. 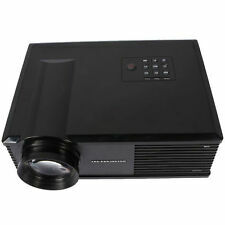 1 x UC18 400lm 1080P Projector. Patent dial-type focusing lens. Abandoned the original rough way of fwisting the lens to be focused. Just need 5 minutes with simple tools to make you resolve your dust problem easily. This projector features a 1080p full HD optimized optical system for unmatched picture clarity and detail along with lens shift, short-throw technology, big zoom, as well as Full HD connectivity and user-friendly interface. Image System:TFT. Image unit: TFT LCD. Note: Projector support 12V power only. HDMI:576P,480P,720P,1080P,640 480,800 600,1024 768,1280 1024,1280 720,1440 900,1920 1080,1366 768,1280 800,1440 960,1600 1200,1680 1050. Adopt light and compact portable design, YG300 LED Projector owns palm size (13.0 8.5 4.5cm). Equipped with HD, USB, AV, Headphone jack and Micro SD card slot, easy to connect with Laptop, PC, Smartphone, USB disk, TF Card, etc. We will help you to check your item. (2018 Mini Portable HD 1080P 4K Android 7.1 Wifi Smart 3D Theater Cinema Projector HDMI USB New. Video Formats: 4K VP9 / 4K 10bits / 1080P AVI（H.264, DIVX, DIVX, XVID, rm, rmvb, WMV, MOV, MP4（H.264, MPEG, DIVX, XVID), DAT（VCD), VOB（DVD), MPEG, MPG, FLV（H.263，H.264), ASF, TS, TP, 3GP, MPG etc. Features: 100% Brand new and high quality. Multichip glass lens to have high quality image. Free exchange from 16:9 to 4:3. Perfect energy saving. With remote controller, convenient for you to use. 1 x 1080P Projector. Patent dial-type focusing lens. Abandoned the original rough way of fwisting the lens to be focused. 1 x US Plug Power. 1 x AV Cable. Input Resolution 1080p. Life hours:20000 hours. DLP display technology; Support 1080P HD display. Digital video processing technology of DLP ensures high brightness, high definition 1080P and real color pictures when projecting. Support connections of WiFi / Bluetooth / USB / HDMI / TF Card. Model:814 Mini Projector. 1x AV signal cable. HD and Mini, adopting LED light source. 1x LED Projector. Lamp type:LED. Color: White. Life hours:20000 hours. Max resolution:1920x1080. Features: Android 6.0 System BL58 employs an optimized Android 6.0 system, Bluetooth 4.0, which is not only simple and easy to operate, but also smoother and stable. With this Android system you can download APPs, watch online movies, play games and surf the Internet. Excellent Performance Perfect For Home Theater You can enjoy vivid images and videos with native resolution of 1280*768 and brightness of 7000 lumens as well as 3000:1 contrast ratio. All these superior features of BL59 combined to deliver you a crystal clear high fidelity image which is perfect for you to enjoy home theater. .
Model:814 Mini Projector. 1x LED Projector. HD and Mini, adopting LED light source. Lamp type:LED. 1x AV signal cable. Aspect ratio:16:9/4:3. Speaker:8Ω 1W. Life hours:20000 hours. Movie format support: MPG/AV/TS/MOV/MKV/DAT/MP4/VOB /1080P Level(Maximum resolution). For iOS Device,you need to prepare a lightning to HDMI cable(Not included)and follow up the usage to set up it. The projector supports screen mirror with smartphone/pad. Support input Resolution 1080p. Input Resolution 1080p. 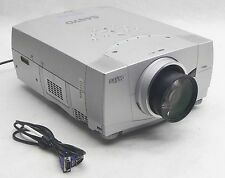 1 x UC18 400lm 1080P Projector. Patent dial-type focusing lens. Abandoned the original rough way of fwisting the lens to be focused. Size: 117mm 84mm 43mm. 1 x Smart Android Projector. What’s makes this device great is you can use it like a single computer that can be connected to the internet wired using the LAN connection or Wireless Wi-Fi connection at once.